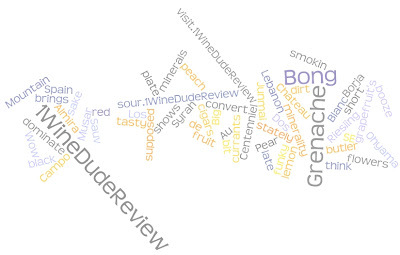 I've been doing a bit of introspection here at 1WineDude.com. Since this is a blog, the introspection has been performed entirely on-line, using two different tools that other wine bloggers have been dabbling with as well. So, no chance of my becoming a better person in the real world - this is virtual introspection, people. Engaging and energetic, you have a lot to offer the world - most of it they've never seen anywhere else! You are the type of person who carves your own path in life... and you invite everyone else to come along. You're all about sampling all of life's experiences. Both the savory and unsavory ones. Surprisingly, I could see myself in some of that description (especially the part about smoked meats and spicy food). And here I've always imagined myself to be a red - one of those interesting and offbeat blended ones, like Priorat. Wrong, baby! The other online tool in which plenty of blogosphere folks are dabbling is Wordle. Wordle is the kind of tool that you play around with for 15 minutes, wonder when / how you'd use it to do anything of significance, eventually scratch your head, shrug your shoulders, and then surf to another website. And pour yourself another glass of vino. Having said that, you will enjoy the 15 minutes you spend on Wordle. 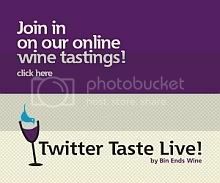 I tried to create some interesting wine reviews using it - sort of a cross between my twitter 'mini' reviews & Chateau Petrogasm. No luck for me (if you figure it out, more power to ya). What I noticed first about this random creation was the proximity of the words "smokin / Bong" and "think / flowers." Maybe this should be 1BluntDude.com? Childish? Nah - it's just me being "Laid back and young at heart" like my 'spirit wine', Sauv Blanc. Nice to meet you Mr Sauvignon Blanc! 'spirit wine' - i like the sound of that! Last week this wine test said I was Pinot Noir, but this week I'm $%^&* Merlot! Actually, I like Merlot. I think I may have answered the background music question differently this week. I'm also a Sauv Blanc! I wonder if this means I need to write about them more? Love the introspective posts! Cheers.